Soon, too soon it seemed, we were winging our way back to our hometown. My sister and S’s brother joined us, and sundry cousins made their way home in a couple of days. We were all in town to celebrate my father’s 84th birthday, which had morphed from a small, intimate family occasion to a big, messy, extended family celebration in a manner that only fellow Indians will understand. Dad’s only request when we had talked to him last year was that his children be there, and that we invite his only surviving sister and her children. Turned out mom wanted to call some of her closest relatives – her ‘girl gang’ so to speak – and it seemed odd, then, that we wouldn’t invite my dad’s other nephews and nieces. Or even others from my mom’s extended family – I mean, you could hardly call one sibling and not the other. You can see where this is going. Right? From around 40 people – just us and our closest cousins – the guest list began to balloon. My sister and I, inviting everyone over the phone, were having to explain who we were to people we hadn’t seen since we were children. And who probably wouldn’t recognise us if we met them on the street! Apropos ‘strange’ relatives: back in Bombay, S2 had exclaimed at meeting a cousin he didn’t know he had – ‘Where do you people hide my cousins away?’ – and since this ‘new’ cousin’s nickname was the same as that of an older cousin he knew very well, he insisted on referring to the newbie as ‘new Appu’. How else could he differentiate him from ‘old’ Appu? How, indeed? Young A and he had also met our cousin’s son and my niece’s son, both toddlers. Much to Young A’s chagrin, he was now ‘uncle’ to the latter. He decided the Western form of relationships was so much better – my niece’s (his cousin) son was his second cousin. ‘Mama’ was too much for a newly-turned teenager to accept. I apologise for the digression. Anyway, the scene was definitely set for a family reunion we haven’t had since the last family wedding. Certainly, S himself was meeting some of these relatives after ages. My cousins were also plotting to go to Munnar to view the ‘Neela Kurinji’. 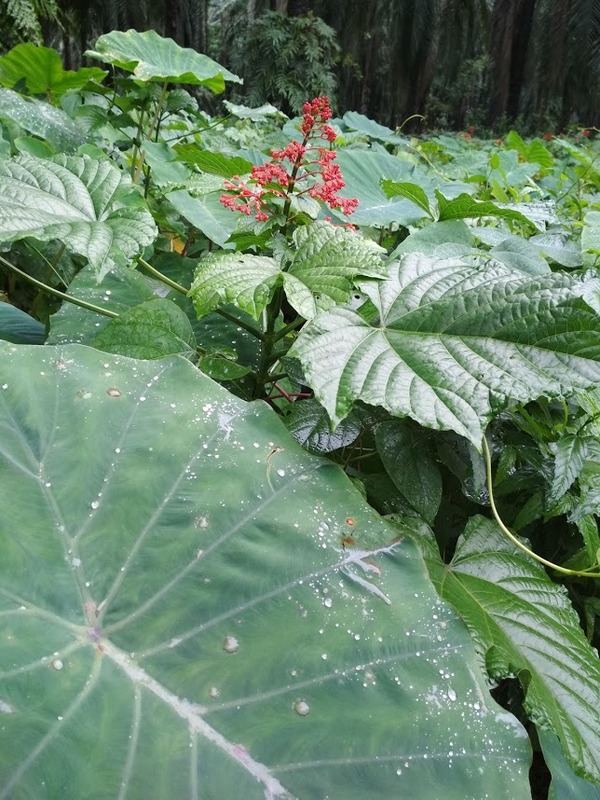 A plietesial (or long-interval bloomers), the Kurinji flowers bloom once in 12 years, carpeting the Nilgiri mountain range, thereby giving it its name. Alas, all our planning came to naught. 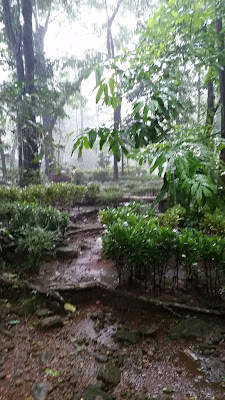 My cousin’s friends who worked in the forest department informed him that the monsoons had ruined the blooming season. My intrepid family moved on to Plan B – perhaps we could all go to Athirapally Falls? All this, amidst planning our father’s birthday. It was great meeting Madhu again. We nattered all the way to the hotel where I’d sensibly booked a room. S and my sister were planning to visit a book fair, and meet us in town. 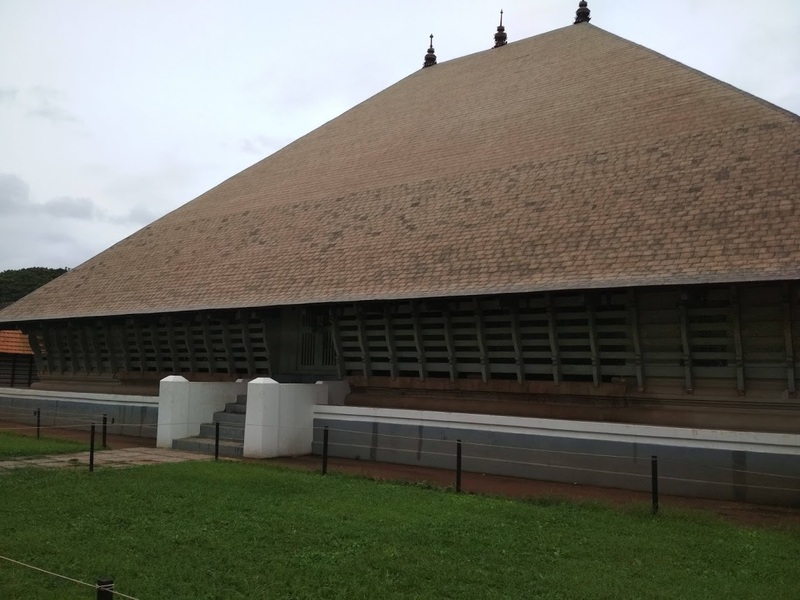 I’d thought of showing Madhu around the Vadakunnathan Temple, a national monument, and one that is on the Archaeological Survey’s list of recommended future UNESCO World Heritage Sites. The temple’s antiquity – it is said to have been built somewhere in the 7th century and is considered one of the oldest Shiva temples in South India – its architectural beauty, and the fact that the lingam is a huge 16ft monolith would, I figured, interest Madhu. 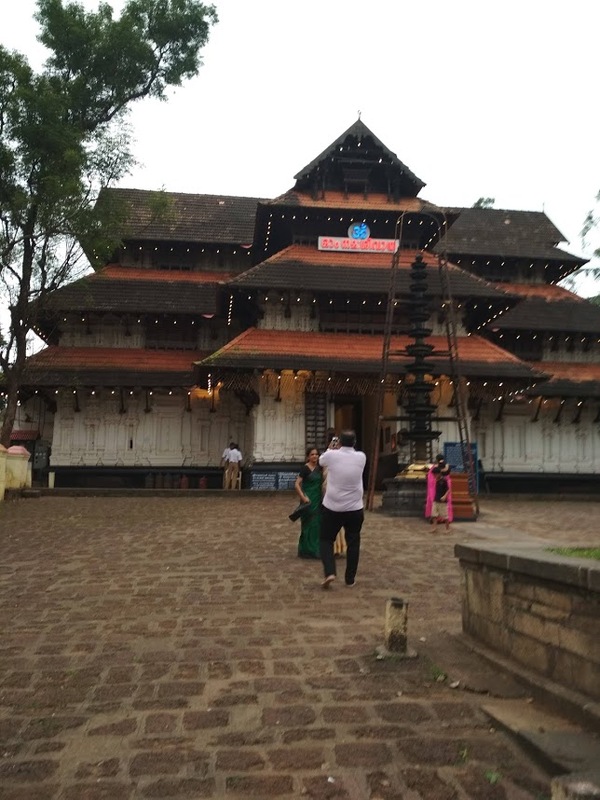 Besides, there's something clean and green and quiet about Kerala temples, and Vadakkunathan is a great example of Kerala's temple architecture. Unfortunately, I couldn’t enter the temple due to a death in the family; S was volunteered to be her tour guide, giving Madhu the gist of the multiple legends and myths. After which, since S wasn’t going to leave Trichur without a visit to Delite Sweet Parlour, I dragged Madhu along to feed her Punjabi samosas and fruit salad. If you’re wondering why samosas in Kerala, Punjabi or otherwise, it’s because they are possibly the best Punjabi samosas ever! 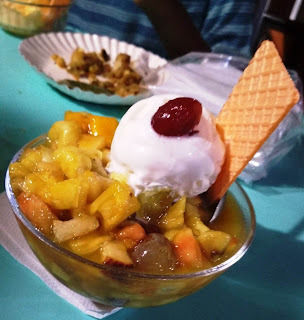 I don’t know what Madhu thought about them, but her eyes certainly opened wide at the fruit salad, chockful of various fruits and topped with vanilla ice-cream. 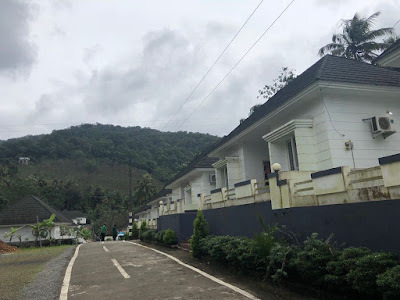 The trip passed without incident – unless you want to count my brother-in-law’s constant appeals to the driver to drive slowly around those hill roads. My cousin grinned, informing him that if the driver drove any slower, the bus might as well be standing still. Alas, the road to the top of the falls was closed due to the rains. So, we had to be satisfied with viewing it from some distance. My cousin had booked us into cottages nearby. They were spacious, clean – and empty. We were the only visitors staying over. The very-attentive staff were, well, very attentive. We got cups of steaming hot tea and coffee and we arranged for lunch at the attached restaurant. The coffee was hot, but not great, and we had some qualms about the food. Which vanished the minute our lunch appeared in front of us. Soft parathas, excellent curries, freshly fried pappadams disappeared into our capacious mouths – suffice it to say we channelled our inner Billy Bunter. After lunch, we decided to brave the elements. Armed with umbrellas, we set off in the direction of the river, just across the road from the cottages. 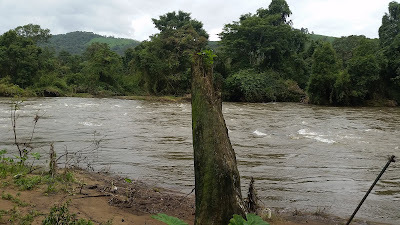 Swollen by the incessant rains, the river was in spate eddying around the rocks, muddy brown and frothy. Both Madhu and Young A refused to wade through puddles to get a closer look at the river. We’d split up into little groups by this time, a cousin deciding to have a bath in the river though we all explained in varying tones of worry and pleading that he was being all sorts of an idiot. Discretion being the better part of his valour, all he did was immerse himself in a relatively calmer area near the shore. The air had definitely sharpened our appetites – we were ready for tea! 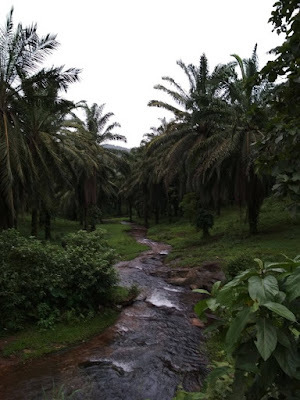 When we returned to the cottages, my aunt informed me that the restaurant had fresh ‘pazham pori’ or fried bananas. Since it is quite a favourite, I promptly ordered them. Madhu had never had them, and I’m glad to say that she liked them quite as much as I did, though I was too busy scoffing myself to enquire closely. 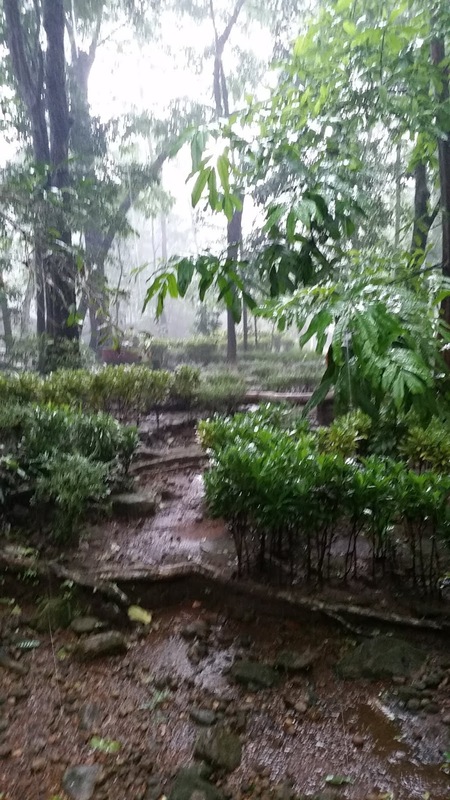 Since the rain gods had deigned to ease off a little, Madhu, my cousin and I decided to explore the area. Everything looked clean and shiny and freshly-washed after the rains. We walked quite some distance when we realised that darkness was falling quite quickly as it’s wont to do in the hills. Quickly, we retraced our steps, walking relatively unhampered across the road, since there was no traffic at all. Suddenly, an elephant trumpeted and it seemed to come from very near by. My cousin exhorted us to cross the road – quickly! Both Madhu and I did, though I was in splits – did she think the elephant wouldn’t cross the road too? A hot bath, some drinks and conversation later, we trooped in to have dinner. What’s a trip without food after all? Madhu was encouraged to try the beef roast. She did, and liked it very much indeed. We were also greeted with some welcome news – the falls would be open next morning! 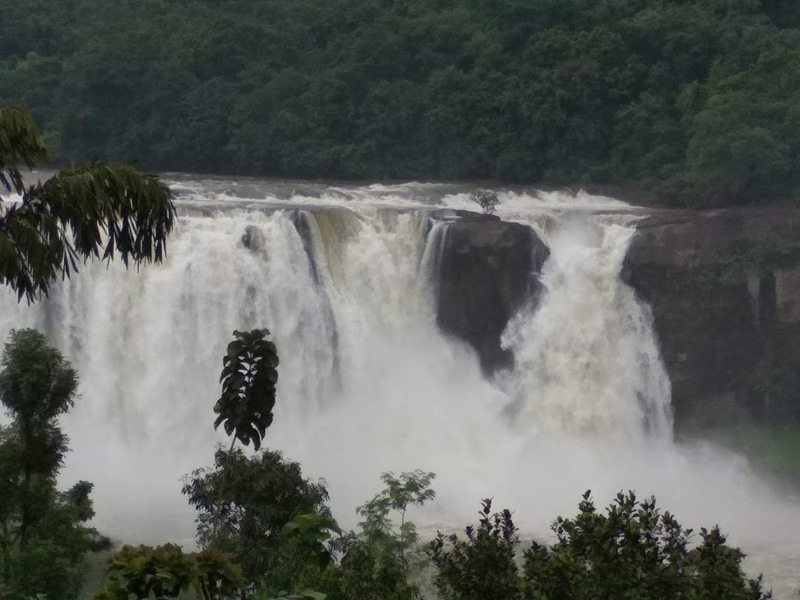 Unfortunately, Madhu was leaving early, so she missed the real grandeur of the falls. The cab came for her at half-past ten and I was sorry to bid goodbye – this was too short a visit, and I’ve extracted a promise of a longer one in the future. As for the rest of my long-and-seemingly-never-ending tale, its thrilling culmination will have to wait for another post.